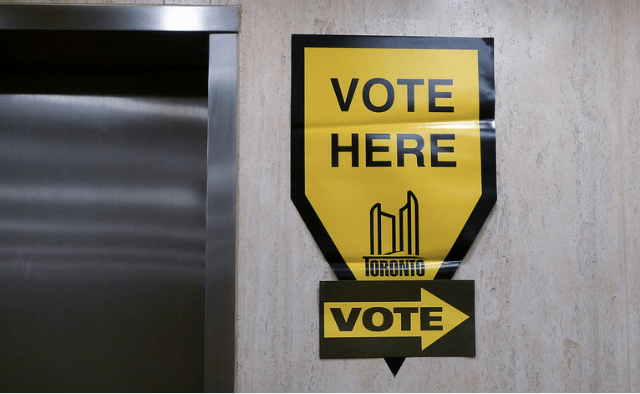 Toronto activists, academics, and community organizers explain what issues voters should consider before they head to the polls. Photo by asianz, from the Torontoist Flickr pool. On October 27, Toronto voters will determine the future of this city. With the 2014 municipal election just days away, candidates are campaigning harder and louder than ever—but how are voters supposed to decide who should lead Toronto through the next four years? We asked some of the city’s top activists, academics, community organizers, and politicians to explain what they think voters should ask themselves before they head to the polls. “Toronto voters should be thinking about the services and infrastructure they want the City to provide and how to pay for them, because the old adage ‘you get what you pay for’ rings true. Mayoralty candidates are promising to find spending efficiencies, invest heavily in critical infrastructure projects (such as transit lines), and reduce the city’s debt, all while holding property tax increases to the rate of inflation (or less). This political narrative, however, does not reflect the true state of Toronto’s finances. “When looking for leadership of any kind, we should look for a leader with good character. Although it isn’t always apparent, we should still factor it in as one of the criteria to consider. Other things to consider are the promises candidates make and what they say they stand for. Their actions will always speak louder than words, but past experience and accomplishments will shed some light on what they are good at and their ability to execute their plan. It is always helpful to understand what candidates will do, how they will do it, and what they’ve done in the past that shows they are capable of doing what they say they will do. “Government no longer has a monopoly on policy-making and problem solving. There are many actors in the urban space—think tanks, academics, non-profits, and community groups—ready to work with council to define policy problems and identify efficient solutions. With that in mind, you could ask yourself whether the candidate that you are considering supporting demonstrates a candid willingness to listen and actively engage with thought leadership as part of problem-solving; and whether they have a real appetite for evidence-based, data-driven debate versus anecdotal problem definition. Ask whether their policy proposals and positions are rooted in research, or seem totally random and unsubstantiated. Why have they prioritized certain objectives over others? Is their vision sufficiently aligned with the contemporary challenges Toronto faces? “History looks fondly upon Toronto’s visionaries. From large-scale planner R.C. Harris to street-view observer Jane Jacobs, all of them had grand ideas for their beloved city. But in their day, most of Toronto’s visionaries faced incredible opposition. Residents voted against city planner R.C. Harris’s Prince Edward Viaduct in a referendum in 1912. The Spadina Expressway was fully under construction before city-planning idealist Jane Jacobs helped get the provincial government to withdraw its support for the project.